It’s St. George’s Day, and what better way to celebrate than with dragons? Title page of Serpentum, et draconum historiae libri duo, 1640. Click to enlarge. Perhaps the most famous illustrations of dragons in our collection come from Ulisse Aldrovandi’s posthumous Serpentum, et draconum historiae libri duo (The History of Serpents and Dragons), 1640. Enjoy the dragons! Click on an image to view the gallery. A dragon made of dried-out fish parts, page 316. An excellent artificial seven-headed hydra, from the treasury of Venice, page 388. A winged dragon, page 420. Another notable Ethiopian dragon with remarkable feathers, page 423. 1. Ulisse Aldrovandi: Italian Naturalist. Encycl Br. Available at: http://www.britannica.com/EBchecked/topic/13659/Ulisse-Aldrovandi. Accessed April 23, 2015. 2. Findlen P. Possessing Nature: Museums, Collecting, and Scientific Culture in Early Modern Italy. Berkeley and Los Angeles: University of California Press; 1996. Available at: https://books.google.com/books?id=MdytpHTVf1gC&pgis=1. Accessed April 23, 2015. 3. An “Ethiopian dragon” | Royal Society Picture Library. Available at: https://pictures.royalsociety.org/image-rs-10449. Accessed April 23, 2015. 4. A “dragon” made from fish parts | Royal Society Picture Library. Available at: https://pictures.royalsociety.org/image-rs-10446. Accessed April 23, 2015. 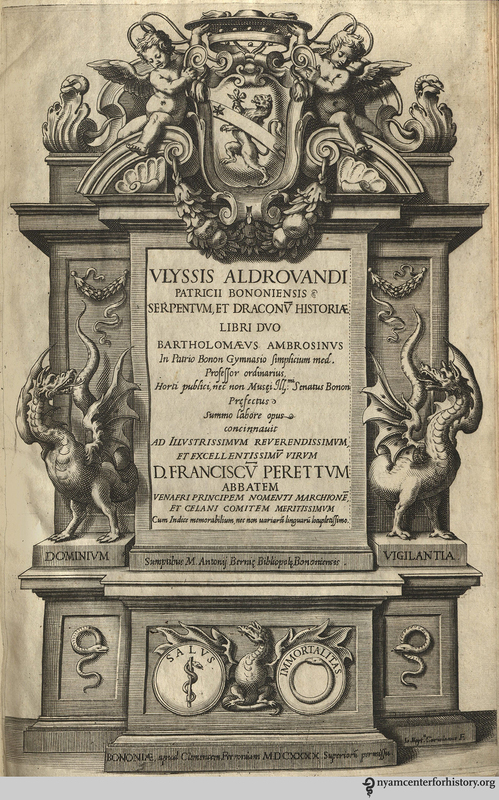 This entry was posted in Collections and tagged dragons, natural history, Serpentum et draconum historiae libri duo, Ulisse Aldrovandi by nyamhistorymed. Bookmark the permalink.